It’s hard to see in the picture, but up until Sunday this was the arrangement in the garage. Pig pen to the front, pullet pen to the back. But the pullets didn’t actually stay in their pen. They were everywhere – all over the garage, in the pig pen, and outside when we’d open the garage door. The first time we let them venture outdoors a few of them hid out somewhere when we rounded them up for the night. The next day I was walking by the kitchen window and noticed them hanging out on the deck behind the garage. I love your rendition of what’s running through Ava’s canine mind! Haven’t figured out where the pigs are going…..I need to move some chicks out of my basement, but I don’t know where they are going to go. Looks like my basement might be a chicken coop for a few more weeks……not good. Poor dog. It is so hard to keep all those chickens in order. Fun to find someone else that fills thier garage with animals instead of cars 🙂 Even funnier, we have a german shepherd too! I am quite surprised at the “herding” instincts that have shown up. 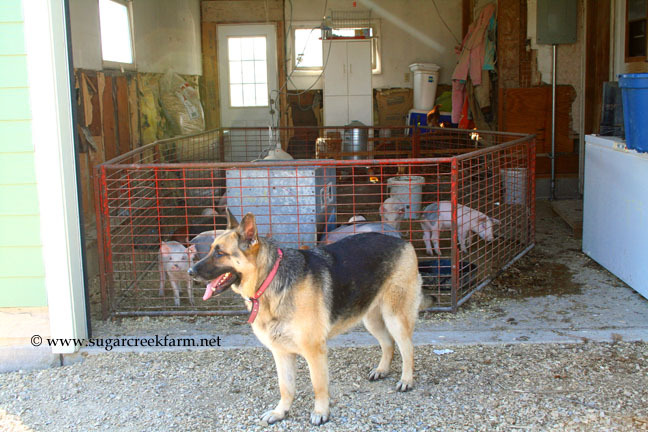 She is great at rounding up loose chickens. Jeannelle – hee hee, she’s a pretty easy dog to “read” :)Kris – a little too seriously sometimes!April – if it’s any consolation, pigs are way stinkier than chicks! Christy – yes, she’s got quite the job keeping the chickens, and the pigs, and the cows, and the cats all in their rightful places ;)barmu – we just need to figure out how to harness her herding desire for good instead of evil! Well, maybe not evil, but chaos anyway.